The October meeting was never called to order; so, no official business took place. The members who attended had the usual post meeting discussions about new projects around Jack's shop. As Bob Torbet's e-mail exclaimed, "We just shot the bull". Those in attendace were Jack Putnam, Bob Hollister, Bob Torbet, Keith Tong, and Ralph Wyatt. I'm sorry that I could not attend the meeting. Seussical the Musical has been taking all of my time. Never agree to build the simple set. It always turns into a not so simple set. And since it was going to be a simple set, why not try out for a small bit part in the chorus, that turns into a roll that involves all of the most complex scenes. Needless to say, I've been swamped. 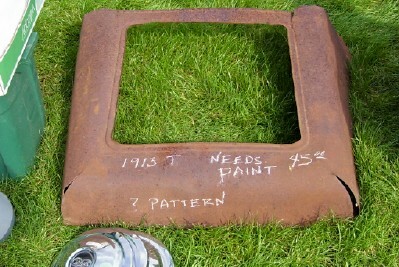 The brush up between performance weekends is on Wednesday; hence, I will miss another great Model T meeting. Some of the things to discuss at this meeting will be the annual Christmas party, new officers for next year, and ideas to get the attendance up. We have a lot of people in the club. The attendance has just been in the teens most of the year. That's only about one-third of the membership. My personal goal is still to get more cars on the road and driving. It is always great fun to run into our friends at Hershey. This is likely the largest swap meet for old cars in the nation or the world. It is said that a stroll around every booth will net about 31 miles. At the right we see Joe Bell resting between sales. Not pictured are a couple of Swedish guys getting out their cash for a short block that Joe had for sale. They say that one man's junk is another man's treasure; but, in this case junk is junk. I took this picture to show my wife, since she didn't have enough vacation left to go to Hershey. She gets a kick out of the stuff that some people try to sell. 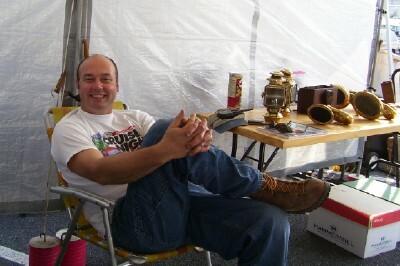 This guy had a lot of other Model T stuff. Just nothing that I was interested in. The car to the right is a Mora. 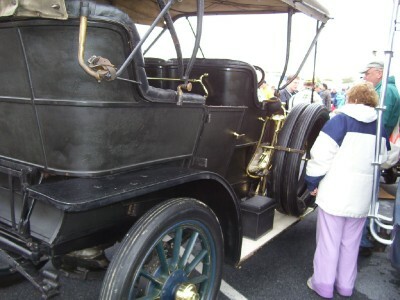 It is one of those huge cars that was popular in the period between 1905 and 1915. This is known as a seven passenger touring. You have the two seat bucket/bench seat in the front, three seat bench in the back, and two seats that pop up out of the floor in the middle. This car looked very original and purred like a kitten. The radiator shot that I got of this car shines too much to see.